The guest commentary below was written by Dr. Daniel Thornton of D.L. Thornton Economics. 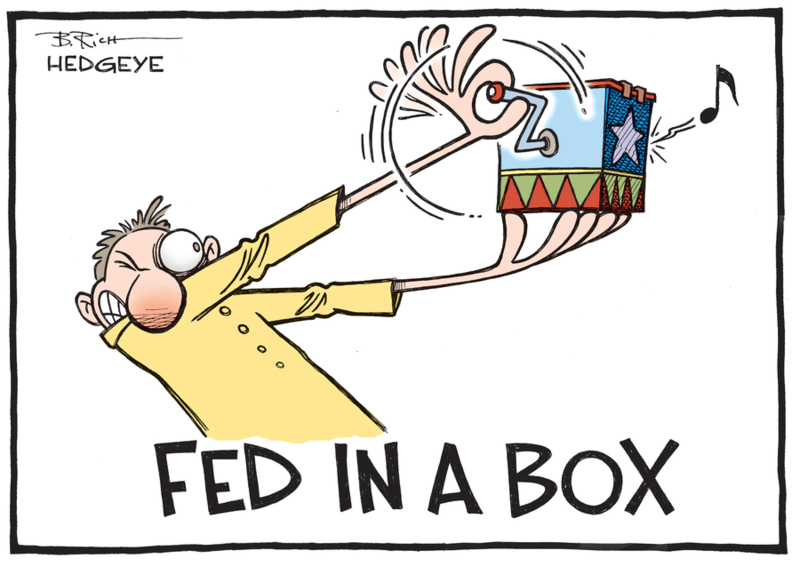 Click here to get Hedgeye's Market Brief, a free weekly newsletter featuring the top 5 trending insights on Hedgeye.com. The Fed has announced its plan to commence the balance sheet normalization by allowing the balance sheet to shrink by $10 billion a month for three months and then ratchet up the amount to $50 billion over the next 12 months, where it will remain until reserves reach a level where the Fed can implement monetary policy as it did prior to September 2008. There appears to be considerable concern about the effect of normalization on interest rates. Bernanke, Yellen, and other policymakers contended that QE significantly reduced long-term interest rates. Bernanke later argued that QE would reduce long-term rates through what he called the portfolio-balance effect. This effect required that the markets where the Fed made purchases be segmented (independent) of other markets or that the market for long-term securities is segmented from the market for short-term securities. However, both of these assumptions are at odds with at least 70 years of financial market research. Apparently aware of this problem, Bernanke and Fed staffers suggested that QE might also reduce long-term bond rates by reducing the term premiums on long-term bonds (the interest rate premium that investors require because long-term bonds have more interest rate risk than otherwise equivalent short-term bonds). However, as I noted in a Policy Analysis I wrote for the Cato Institute in 2015, the term premium is determined by two things (market participants’ aversion to risk and the interest rate risk characteristics of the specific bond) that are independent of the quantity of bonds in the market. For example, this means the Fed cannot reduce the term premium of a 20-year Treasury relative to a 10-year Treasury buy purchasing a large quantity of 10-year Treasuries. The only way Fed purchases can reduce term premiums is if the least risk-tolerant investors leave the Treasury market while the most risk-tolerant investors remained. Fed staffers suggested that QE might reduce long-term yields this way. However, it is unlikely that the least risk-tolerant investors would leave the security of default-risk-free Treasury market. Bernanke once quipped, “The problem with QE is it works in practice but it doesn’t work in theory.” But the evidence suggests QE doesn’t work in practice, either. Most researchers have found a small effect of QE on long-term rates (about 10 to 15 basis points)—far too small to have an important effect on spending. Some research by Fed staff found larger effects (60 to 80 basis points). However, this research was flawed. When these flaws were corrected, the effect of QE on long-term bond yields and term premiums vanished. QE had no effect. The “evidence” of QE’s effectiveness most commonly cited by Bernanke, Yellen, and others come from event studies. Event studies look at the change in various long-term bond rates the day after important QE announcements. In a recently published paper, I show that most of these announcement effects are not statistically significant. That is, the change in interest rates on QE announcement days is not unusually large compared with changes on days when there was no Fed or other important announcements. Of the remaining announcement effects, the largest ones were offset within weeks of the announcement. The others suffered from other, less obvious problems that significantly reduced their evidentiary value. I concluded that QE event-study announcement effects provide no evidence that QE reduced long-term rates. If the Fed massive bond-buying program didn’t reduce long-term rates, there is no reason to believe normalization will increase them: There’s no reason for concern. QE’s lack of effectiveness also means that there is no reason for normalization to proceed at a snail’s pace. The Fed can and should return its balance sheet to “normal” as quickly as possible. This is desirable for several reasons, not the least of which is the fact that QE has created an enormous in excess reserves that produced a massive increase in the money supply (the M1 money measure has increased by 250% since August 2008). While the increase in M1 has not been accompanied by an acceleration of inflation, one cannot help but be concerned about the potential effects of such an unprecedented increase in liquidity. Finally, while there is no evidence that QE or the Fed’s low-interest-rate policy more generally has helped the economy, there is considerable evidence of harm. Monetary policy since 2008 has promoted excessive risk-taking by pension funds and others, forced retirees to choose between undesirable alternatives—living on less or taking more risk, and exacerbated income inequality. The sooner the balance sheet and monetary policy return to normal, the better.